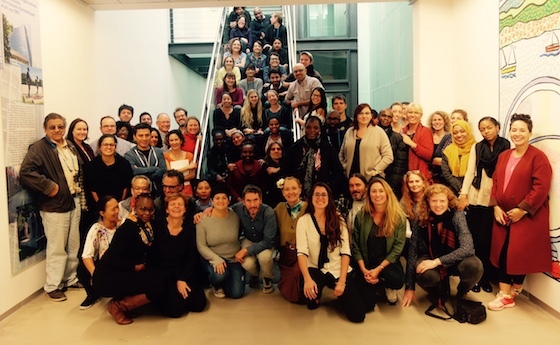 ESCR-Net members and allies are working collectively to advocate for a strong #bindingtreaty at the United Nations to #stopcorporateabuse and to prevent and remedy human rights violations by transnational corporations and other companies. The Corporate Accountability Working Group of ESCR-Net (CAWG) participated today in a strategy meeting of the Treaty Alliance. The aim of the meeting was to coordinate activities with members and allies, in order to be in a strong position to engage constructively in the third session of the Intergovernmental Working Group (IGWG) that starts tomorrow. CAWG’s engagement in this session builds on collective advocacy over recent years and its most recent collective submission which highlights key issues to consider in treaty negotiations, including preventing the prioritization of corporate interests over human rights (known as ‘corporate capture’), ensuring the centrality of women’s leadership and lived experiences, and taking positive measures to create enabling environments to support human rights defenders in carrying out their essential work. Press Conference – Launching of the Week of Peoples Mobilization and of the Treaty Alliance Statement. 11:45am – 1pm at UN Square. Side event – ‘Mind the Gap: A Feminist Approach to the Binding Treaty’. 1-3pm at Room XXIII. Please follow the streaming of this event in our Facebook page. Visit our website for key documents, collective advocacy and more information on our daily activity, including video interviews with ESCR-Net members and more.